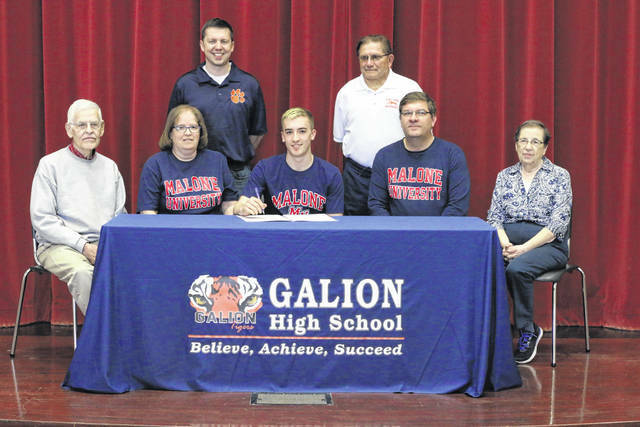 GALION — On Friday, April 27, Galion High School swimmer Sam Rigdon was joined by his parents and grandparents, as well as coaches Ted Temple and Curt Wiggins, to sign his letter of intent to attend Malone Univeristy and to swim for the Pioneers next season. “I didn’t even schedule a visit,” he said of his decision process in picking Malone. “They were able to squeeze me in and I was able to meet with the swim coach. It all just felt right when I was there. Everyone was friendly. I was already accepted and had financial aid lined up. ”I think that it all came down to the coach looking up my times on the way over to meet with me,” Rigdon joked. Rigdon may be saying goodbye to Galion when he walks across the stage and receives his diploma in a few weeks, but what he accomplished in pools throughout Ohio for the blue and orange will not be easily forgotten. Most notably in his career, Rigdon was a part of four, Mid-Ohio Athletic Conference champion teams. In his tenure for the Tigers, Sam has been name to the All-MOAC first-teams 12 times, including a 4/4 effort during the 2015-2016 conference championships. In the other four possible attempts at all-conference honors, Rigdon snagged second-team all-conference honors and was twice named Boys Swimmer of the Year (2015-2016 and 2017-2018). Rigdon plans on persuing a degree in sports management at Malone, and has not yet decided on a minor. Erin Miller | Galion Inquirer Galion Tigers swimming standout Sam Rigdon (seated, center) was joined by his parents, grandparents and coaches on Friday, April 27 as he signed his letter of intent to swim for the Malone University Pioneers. https://www.galioninquirer.com/wp-content/uploads/sites/38/2018/05/web1_IMG_1437.jpgErin Miller | Galion Inquirer Galion Tigers swimming standout Sam Rigdon (seated, center) was joined by his parents, grandparents and coaches on Friday, April 27 as he signed his letter of intent to swim for the Malone University Pioneers.